Almost all of us have dealt with a leaky pen at some point in our lives. While fountain pens have the reputation of being the messiest, other types of pens like ballpoint pens, rollerball pens, markers, and sketch pens may also end up staining your hands, clothes, and carpets. 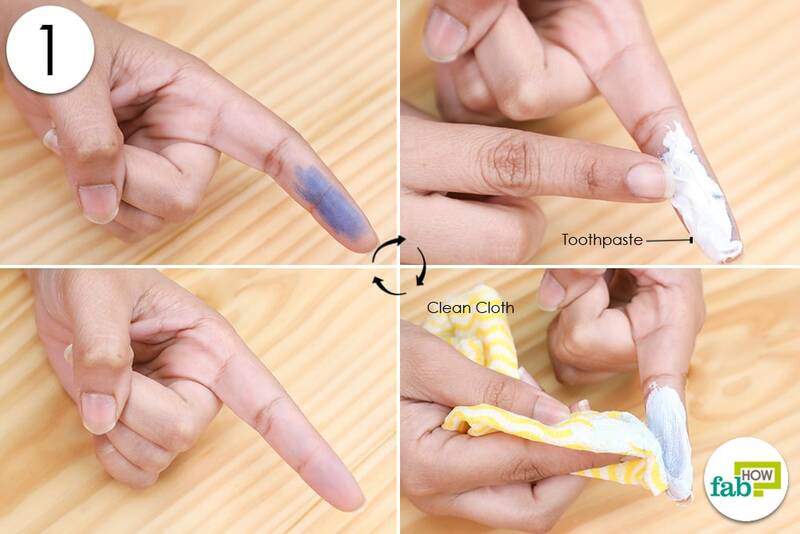 Removing ink stains from clothes, sheets, and carpets can be extremely hard. 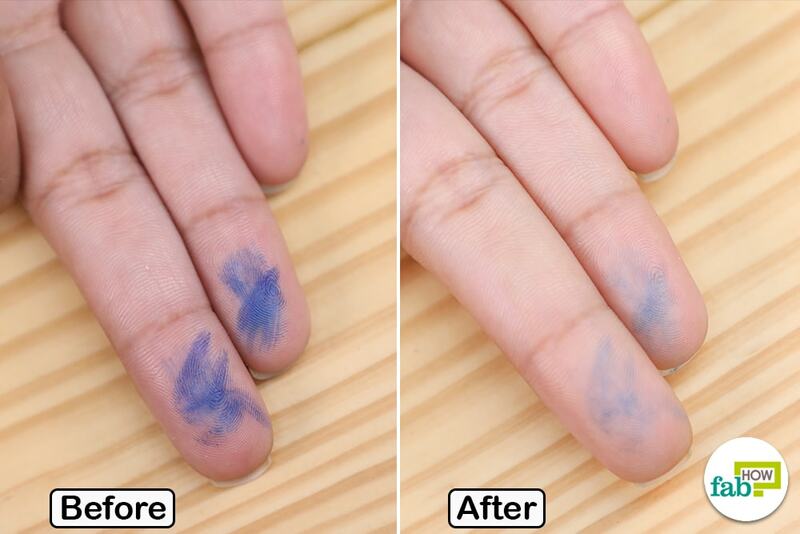 Thankfully, cleaning up ink-stained hands is much easier. All you need are the right tools! Non-water-based and water-based inks are the two types of ink you may have to deal with. Water-based inks are temporary and water soluble. In most cases, just washing your hands with soap and water is enough to get rid of the stains caused by a water-based ink. On the other hand, non-water-based inks are insoluble in water and are generally considered to be permanent. To remove stains caused by non-water-based inks, you need something stronger, such as solvent-based agents (acetone, rubbing alcohol, etc.). 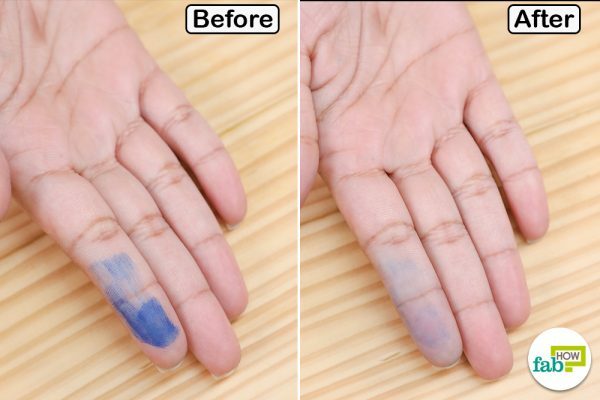 There are a number of household remedies that can be used for clearing up ink stains caused by leaky pens, printer cartridge, etc., from the skin. 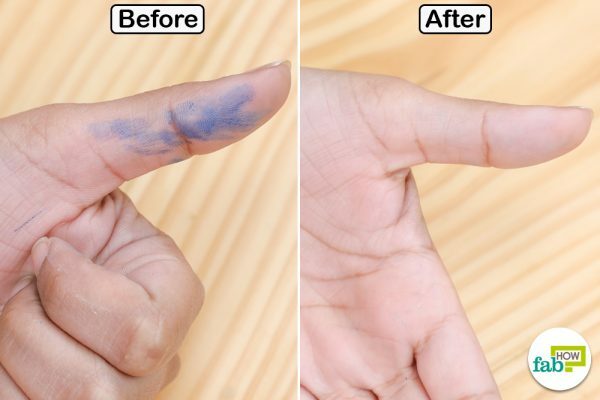 Here are ten simple ways to remove ink stains from hands. If soap and detergent fail to clean up your ink-stained hands, turn to your hair shampoo! Heavy-duty shampoos are one of the most effective ways to get rid of water-based ink stains from carpets or other surfaces. 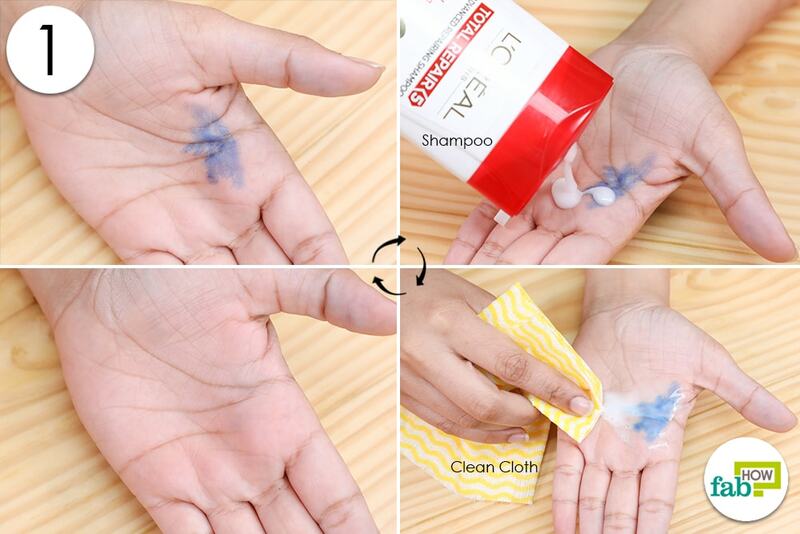 Shampoo can also be used to get rid of pen ink from hands and nails. It helps to dissolve the stains and remove the ink from your skin. Generously apply shampoo over the stained area. 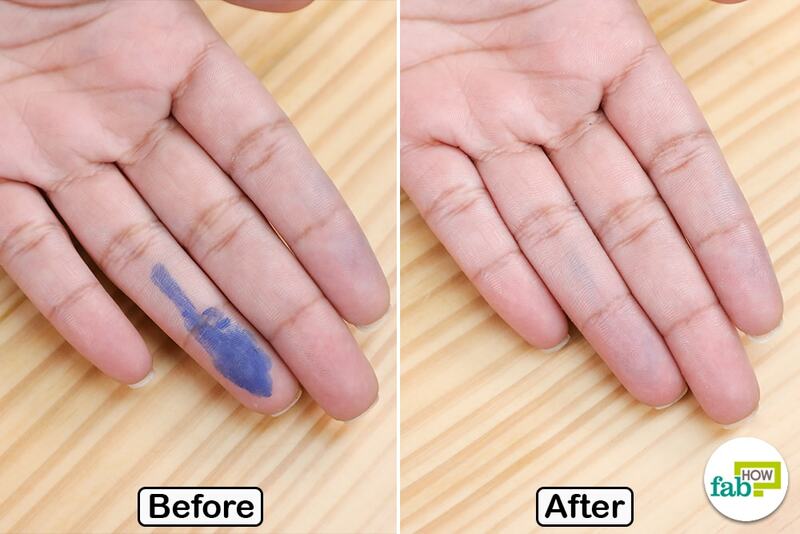 Use a cloth or paper towel to wipe away the ink stain from your hand. Continue wiping until the stain comes off completely. 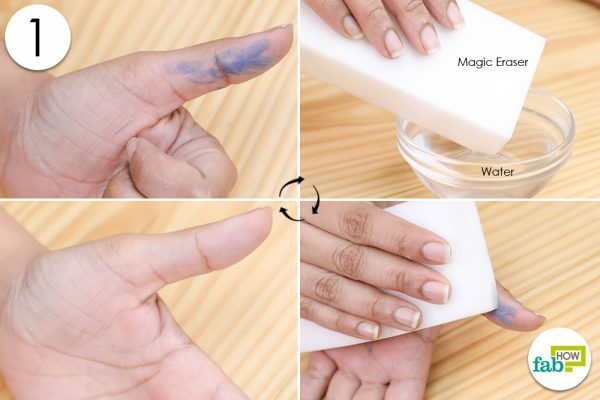 Magic eraser is just the miracle you need to get rid of stubborn ink stains from your hands and even permanent marker stains from wood. It will help in removing the ink without the need to vigorously rub the stained area. 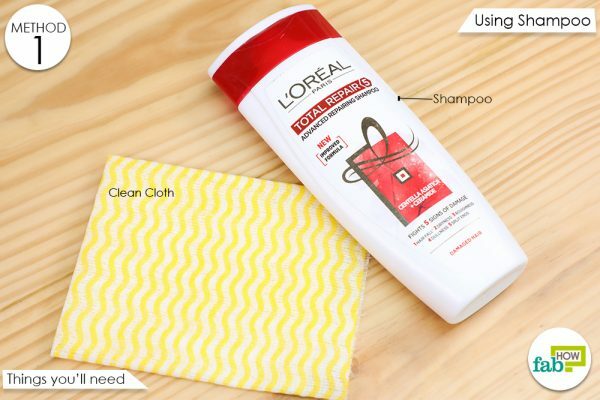 The nonabrasive sponge of this product will make sure your skin is not damaged in the process. Also, this inexpensive method yields quick results. Dip a corner of the magic eraser into the water. Use it to gently rub the ink stain off your hand. Continue rubbing until the stain comes off. 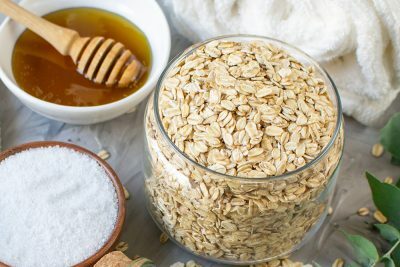 If you are a fan of DIYs and household remedies, you must be aware that this common household commodity serves several purposes beyond cleaning and protecting your teeth. Toothpaste is one of the simplest ways to remove ink stains from hands. It contains fine abrasive agents and detergents and can be used as a cleaning agent. Toothpaste can be effective in removing crayon from walls, getting rid of stains from clothes, cleaning headlights, removing watermarks from wood, polishing jewelry, and whitening shoes, among other things. 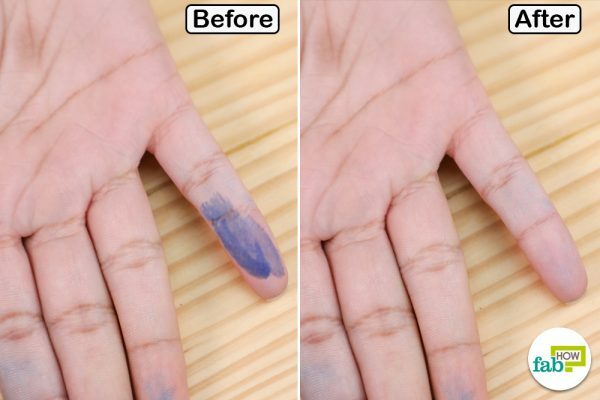 To remove ink stains from your hands, you will need non-gel toothpaste which helps to lift off the ink stain from your skin. Apply an adequate amount of toothpaste over the ink stain on your hand. 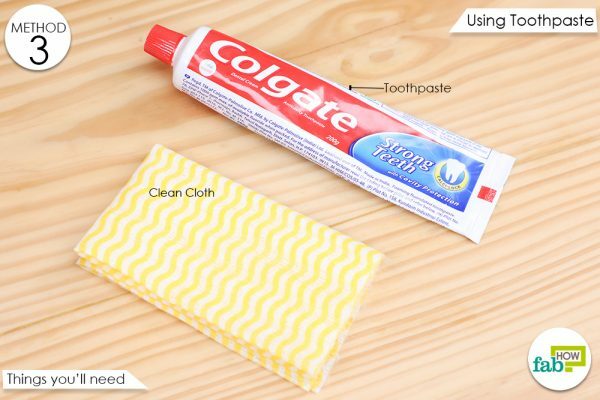 Use your finger to rub the toothpaste onto the stain. Continue rubbing for a few seconds. Leave the toothpaste on for a minute or two. Use a cloth or paper towel to wipe off the ink stain from your skin. Wash your hands using soap and water. Finish it off by applying a moisturizing hand lotion. Rub off the ink stain using this mild yet effective baking soda and sugar scrub! The mild abrasive property of baking soda and sugar will help remove the ink from the affected area in no time. All the ingredients used in this remedy are absolutely safe and work for all skin types. 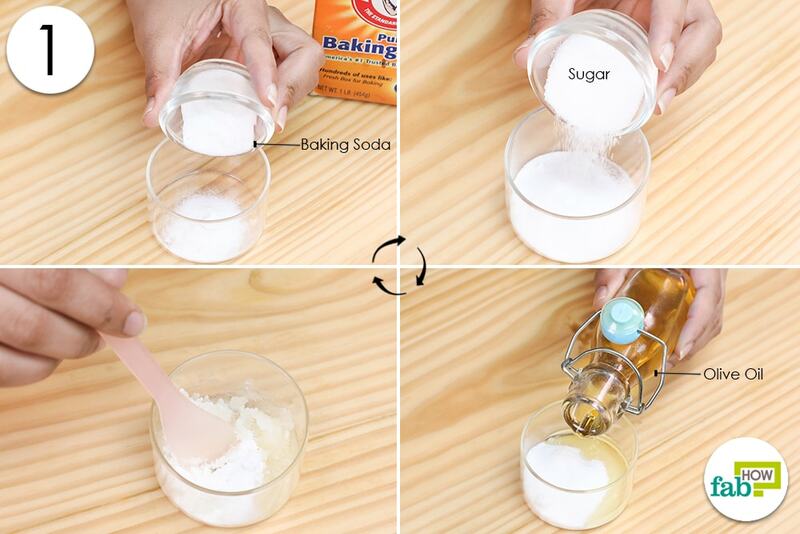 In a bowl, combine equal parts of sugar, baking soda, and olive oil. Mix the ingredients well to form a mixture. Take a sufficient amount of the sugar and baking soda paste and rub it over the stain. Continue rubbing until you see the stain coming off. Make sure you do not put too much pressure on your skin while rubbing away the stain. Lemon is commonly used for various household cleaning purposes. It cuts through grime with ease and also deodorizes the surface it is used on. 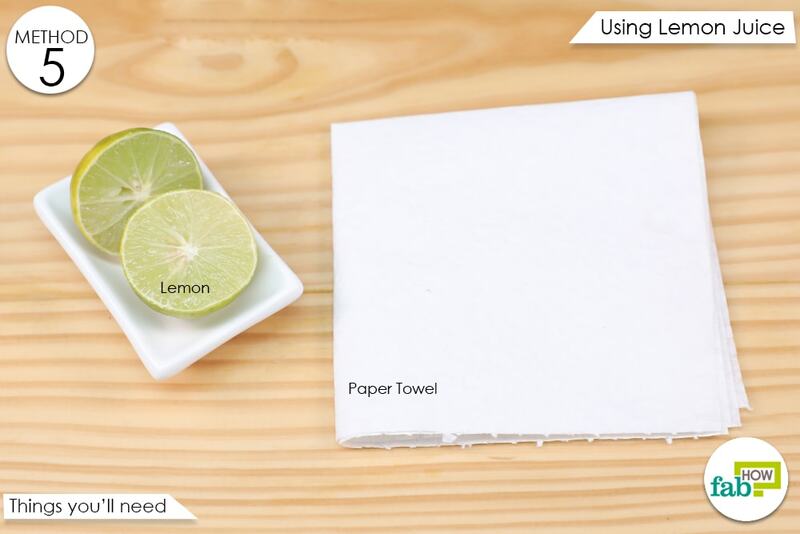 Owing to its citric acid content, lemon juice acts as a natural bleaching agent and can help in clearing up skin stained with ink. Rub half of a lemon over the stained area. Make sure you gently squeeze the lemon while rubbing to get the juice flowing. Keep rubbing till you see the stain coming off. Finish it off by wiping your hand with a paper towel. 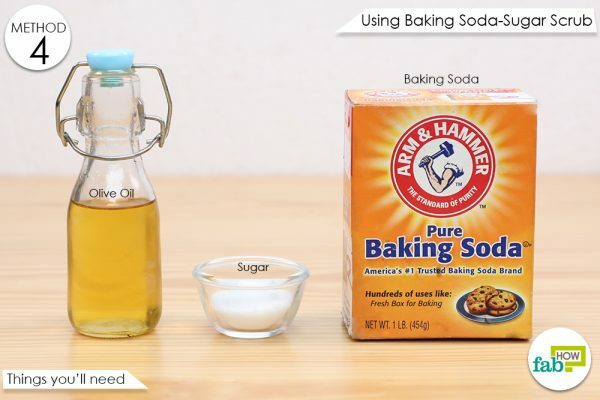 This traditional glass cleaning solution can be found in almost every household. 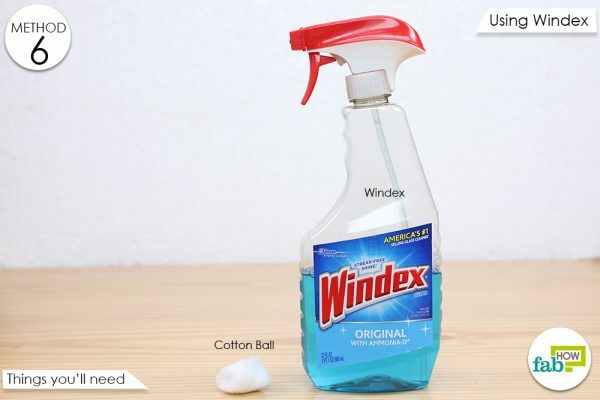 Windex can be used for removing stains such as coffee, drinks, food, ink, oil, and grease from various surfaces. 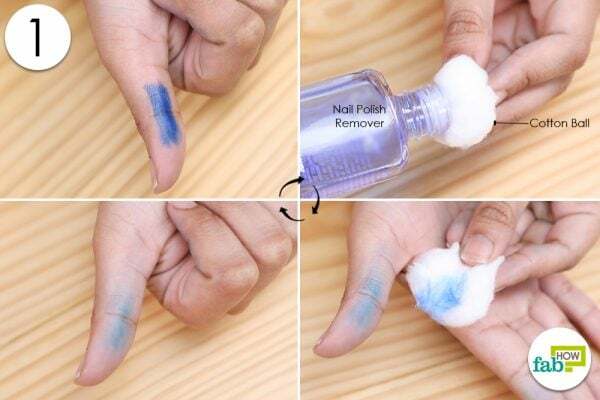 It can also be used for clearing ink stains from skin. Windex and other glass cleaners are useful in getting rid of ink stains due to the presence of ammonia. However, you need to be really careful while using these products over your skin. In case you experience skin irritation or burning sensation, wash your hands immediately and refrain from using this method. Windex works best for fresh ink stains. Spray some Windex on a cotton ball. Rub the cotton ball on the stained area of your hand. Continue rubbing until the ink comes off. 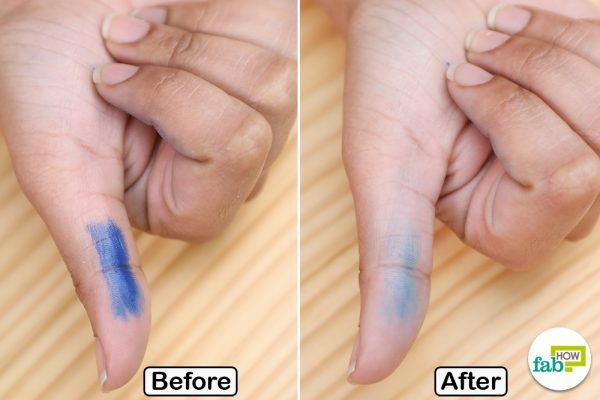 You do not require hand cleaners or other special products for doing away with those unpleasant ink stains on your hands. Another simple way to remove ink stains from hands is a makeup remover. All you need to do is look into your makeup kit for the right solution! 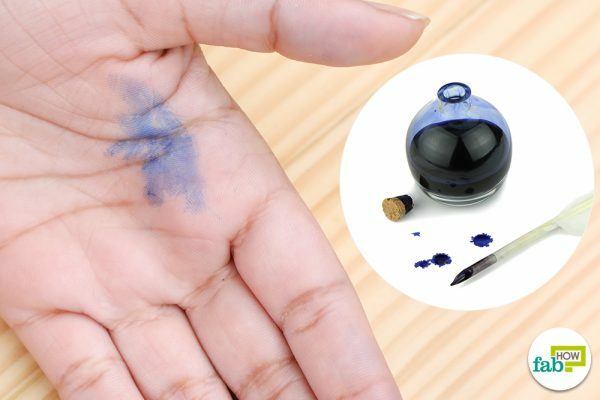 Your eye and face makeup removers can be effective in removing ink from your skin. 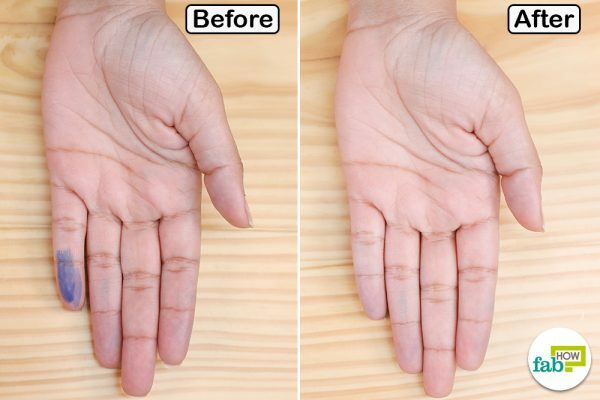 Both liquid- and cream-based removers can be used for this remedy. Because these products are made to be used on the skin, you don’t have to worry about any irritation and other side effects. 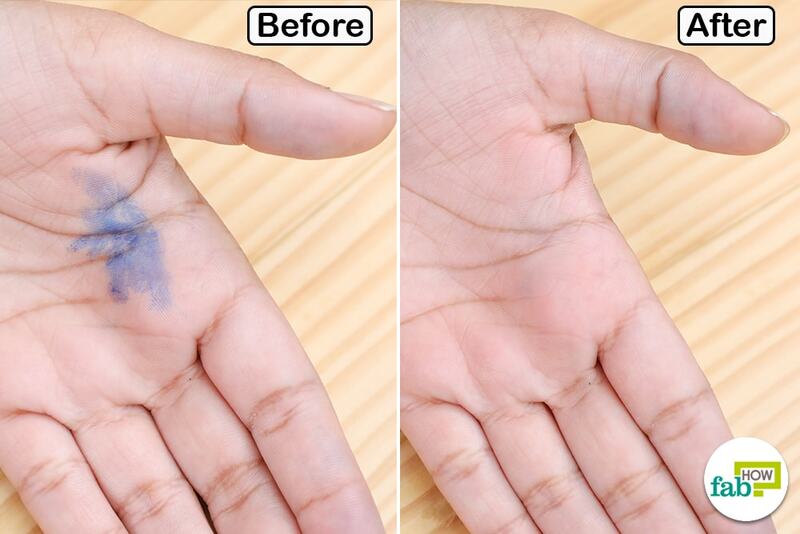 Apply makeup remover on the stained area of the skin. Use a cotton ball to rub the ink stain off. Finish it off by washing your hands with warm water and soap. This ingredient is commonly used as a solvent in several cleaning agents. 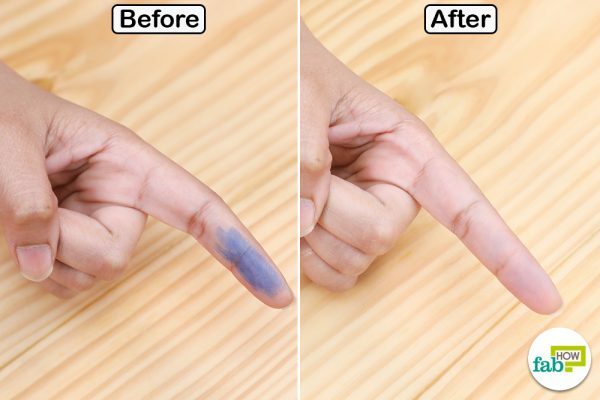 Rubbing alcohol is one of the most effective remedies for getting rid of ink stains from skin. It works especially well for cleaning up oil-based ink. 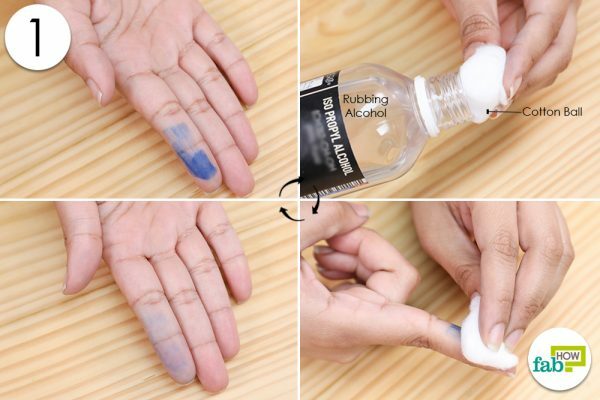 Rubbing alcohol works by dissolving the ink, making it easier for you to wipe it off your skin. Moisten the cotton ball with rubbing alcohol. 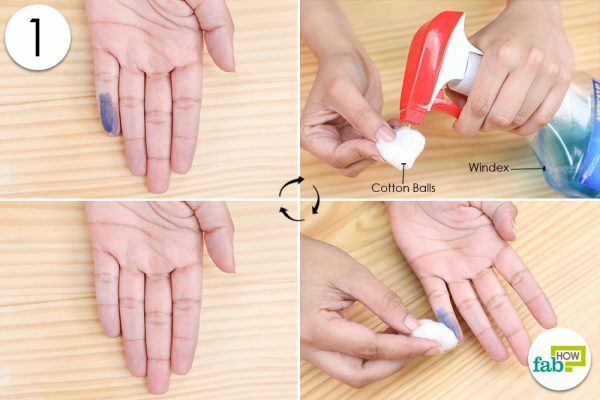 Use the cotton ball to rub the ink stains off. Nail polish remover can be used to get rid of ink stains from your skin. Acetone, the solvent present in nail paint removers, works by causing the ink to break down and dissolve so that it can be wiped off effortlessly. This ingredient can be harsh on your skin. It is best to use it in small amounts and wash your hands immediately after removing the ink stain. 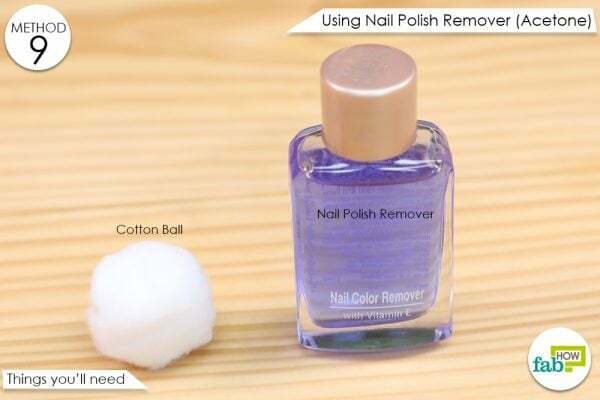 Put a little amount of nail polish remover on a cotton ball. Rub the stained skin using the cotton ball. Rub until the stain comes off. Another standard household item that you can use to remove ink stains from hands is tea bags. The oils present in the tea and the semi-abrasive material of the tea bag will help clean up the ink on your skin in no time. Let the freshly used tea bag come down to room temperature before using it on your skin. Rub the stained area with a freshly used tea bag. Keep rubbing until the stain comes off. The faster you deal with the ink stains, the better. They tend to get harder to remove on drying up. Nail paint remover and rubbing alcohol must be used in well-ventilated areas as the vapors from these products can be harmful. 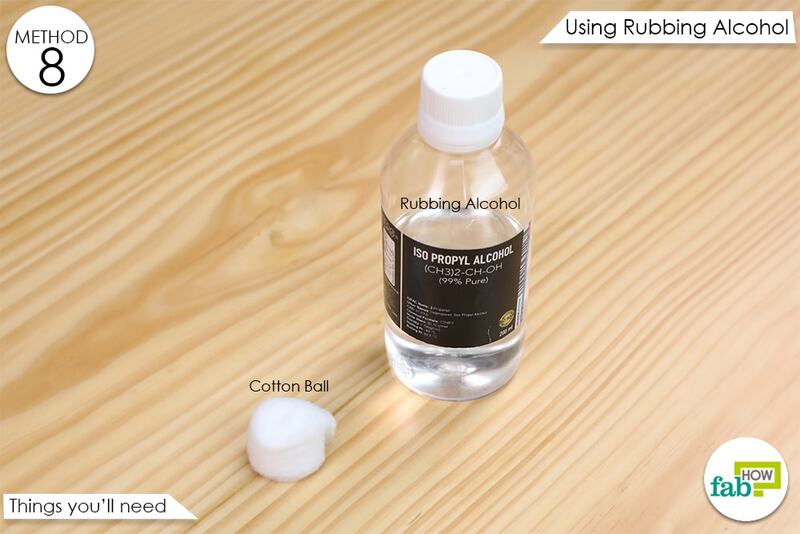 Nail paint remover is a strong solution that is capable of removing the finish of your furniture. Be careful while using it. Alcohol and nail paint remover are highly flammable. Do not use these liquids near a heat source or open flames. Don’t exert too much pressure while rubbing the tea bag over the stained skin as this may cause the bag to break and create a mess. 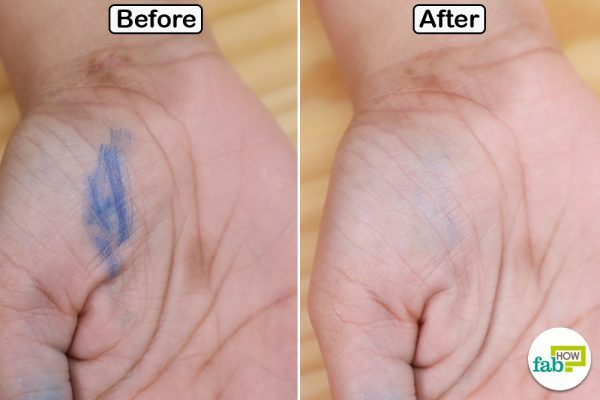 Tea tree oil, hair spray, baby oil, hand sanitizer (alcohol based), and white vinegar are few other things you may use for removing ink stains from skin.